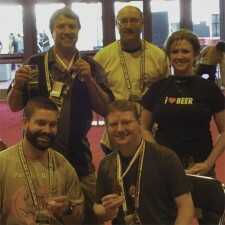 O'Fallon Brewery Wins Silver Medal At GABF! O’Fallon Brewery Wins Silver Medal At GABF! O’Fallon, MO – The O’Fallon Brewery and St. Charles County homebrewer Jim Yeager earned second place in the 2009 Pro-Am competition at the Great American Beer Festival on Saturday, September 26 in Denver. The winning entry, “Alright Already Amber,” is an American-Style Amber that was created by Yeager, brewed by the O’Fallon Brewery and sold on a limited basis at several area retailers. Brewery President Tony Caradonna is especially proud of the cooperative venture with local homebrewers. “We have a special relationship with homebrewers. They are enthusiastic about beer, innovation and are some of our best customers. I am thrilled, but not surprised, that our first Pro-Am entry was a winner,” said Caradonna. Alright Already Amber is available on draft for a limited time at Blue Sky (O,Fallon), Cicero’s (University City), the International Tap House (Chesterfield Valley) and The Stable (St. Louis) and will be offered at the Augusta Bottoms Beer Festival on Saturday, October 3rd in Augusta, MO.